ejhartman91 wrote: Source of the post I thank this thread for my purchase of the $25 Insignia speaker. ejhartman91 wrote: I blame this thread for my purchase of the $25 Insignia speaker. Only one?! Go back and get more. 2 for $50 or 2 for $70 of the battery best buy ones. Bought more today (will be paid back). I've personally bought 10+ of these now? Again, not all for me. Combo of mine, gifts, and paid requests. Who is paying you to buy these? Does someone you know not have internet? Tyler wrote: 2 for $50 or 2 for $70 of the battery best buy ones. Bought more today (will be paid back). I've personally bought 10+ of these now? Again, not all for me. Combo of mine, gifts, and paid requests. ejhartman91 wrote: Source of the post Who is paying you to buy these? Does someone you know not have internet? Haha. Mother in law wanted one for home, then one for outside, then one for her classroom, then one for her sister. I work next to Best Buy so just easier for me to run over there. Are you at least reaping the Best buy rewards points? ejhartman91 wrote: Are you at least reaping the Best buy rewards points? That I do nothing with. Is that system even good now? Hasn't it always been good? I just know I would get random $5-$20 free coupons from time to time when I shopped there more regularly. 2 more Best Buy versions for my sister/BIL. They wanted one in the bedroom and one in the basement living room. They are also jealous of my battery powered big one. My favorite part of having these is being able to have the same music playing throughout the whole house. So I can be hearing the same song while in the basement grabbing a beer, in the kitchen prepping food, and out on the deck grilling with the battery one. wags83 wrote: My favorite part of having these is being able to have the same music playing throughout the whole house. So I can be hearing the same song while in the basement grabbing a beer, in the kitchen prepping food, and out on the deck grilling with the battery one. I don't even like music and I love doing that. Corey must be jealous he doesn't have a wireless deck speaker. I absolutely don't need more, but those prices! Google Home is going to start using Keep again for lists! Got this yesterday for 50% off. Basically a Google Home with a screen. I think it will be used a lot for displaying recipes or even shows while cooking. It's not necessary, but I had allowance burning a hole in my pocket and it does have nice visual aids for Google home type stuff. I also switched my default music service from Google Play music to YouTube Music. This has more features for YT music (and I pay for both). I am keeping the dakboard up in the kitchen because I like the full month calendar view. 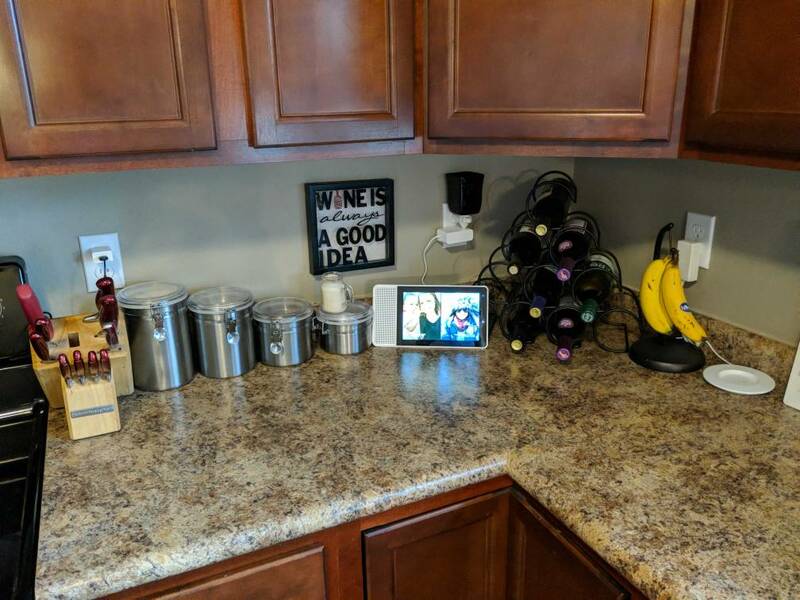 I have the two devices on different counters. I did eliminate my OG Google Home from the kitchen entirely since this screen version has a decent speaker and mic. Liking my Lenovo smart display. Yesterday when I was cooking I was watching Plex on it. Can't start Plex from it directly, but I was able to cast to it from the phone app. Once it's playing you can pause and resume from the Smart Display. Tyler wrote: Liking my Lenovo smart display. Yesterday when I was cooking I was watching Plex on it. Can't start Plex from it directly, but I was able to cast to it from the phone app. Once it's playing you can pause and resume from the Smart Display.